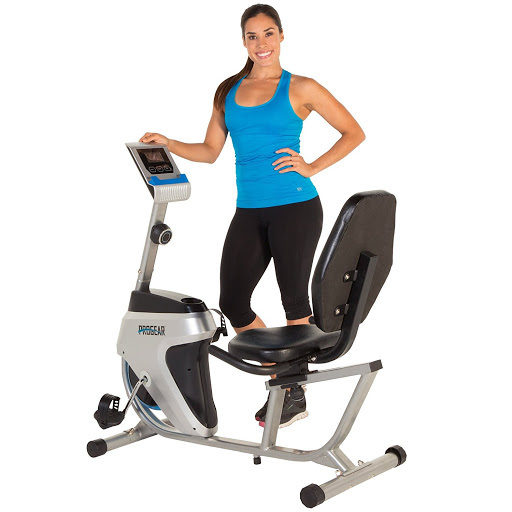 In line with other economical recumbent exercise bikes that I have reviewed, consisting of Marcy ME 709 (Link: [article 1]) and Exerpeutic 900XL (Link: article 4]), Progear 555LXT is also a considerable choice. This bike has a very affordable price, a compact build that brings a nice pedalling experience, and some good programs featured in a console. 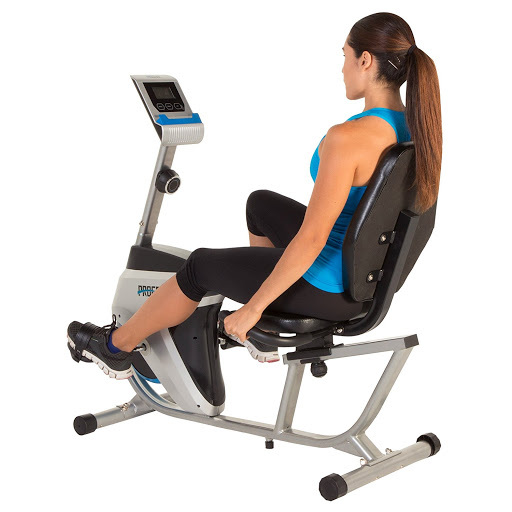 The Progear 555LXT Recumbent Bike really can motivate you to achieve your fitness goals and help make you healthier. In this review, I will show you all the details about this bike. 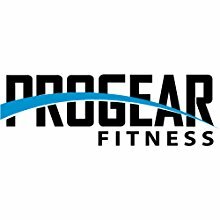 Progear Fitness specializes in health and performance supplements. Its commitment is to provide only the highest quality products. They provide a range of accessories and fitness gear for any terrain. The company is located in South Africa and focuses on nutrition products. They just produce a limited number of exercise bikes. 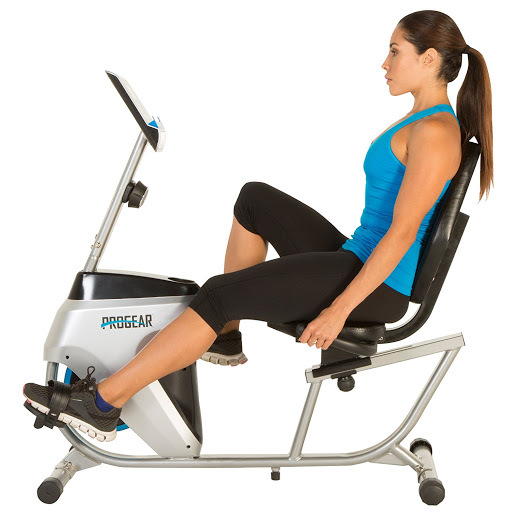 Therefore, Progear Fitness isn’t a really big brand in the exercise bike market. However, it does have some good affordable exercise bike model. Progear 555LXT is one of them. 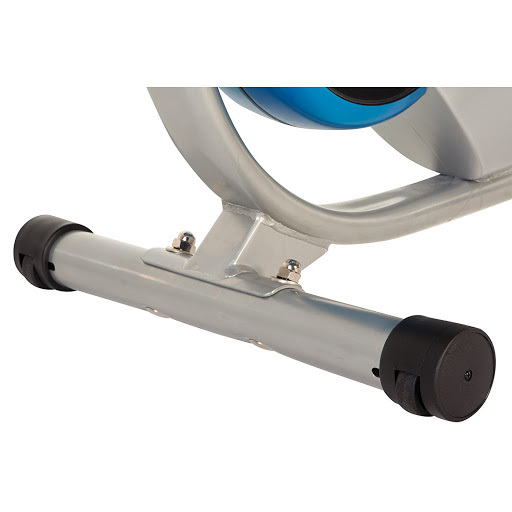 When it comes to indoor exercise bikes, there is a wide range of types, based on diverse user needs. For example, Upright Stationary bikes for traditional users, Indoor Cycling Bikes for those want serious workouts, Dual-action Stationary Bikes for those want full body workouts. Among those, Recumbent Stationary Bikes are the bikes for maximizing comfort, blood flow, cardiovascular and lower body workout. This is the goal when they design Progear 555LXT. Progear 555LXT focuses on the comfort and the easiness for the user and is the best choice for those want to maintain a healthy lifestyle, or being in a physical rehabilitation and physical therapy. It is designed for those have problems with joints or being injured, especially for kids, women and oldsters. This recumbent bike is like a chair with pedals in front of the seat. This design makes it easy on your back and knees, making sure that you will feel enjoyable and won’t have any injury while practising. Overall, Progear 555LXT looks nice in black and white. This is quite a small bike. Indeed, The dimensions are 43H x 22W x 49L inches and the weight is 60 pounds. It is compact enough for any place. Despite its compact design and lightweight, Progear 555LXT can support users up to 250 lbs and 6 feet 3. Progear 555LXT can be assembled. You can disassemble and store it easily when you don’t want to use it for a long time. Progear 555LXT’s steel-made frame has a good quality, as well as the seat, handlebar and pedals, which will offer you a stable and smooth exercise experience. An intuitive console table with tablet shelf is ready to give you full control of your workout, and also allow you to read books/watch movies/surfing the internet while practising. And a water bottle holder allows you to stay hydrated without interrupting your workout. In fact, this recumbent bike does not come fully assembled. The only pre-installed components include the drive and frame. To unbox and assembled it, you might need more than 1 hour. I’m sure that you will need someone’s help. 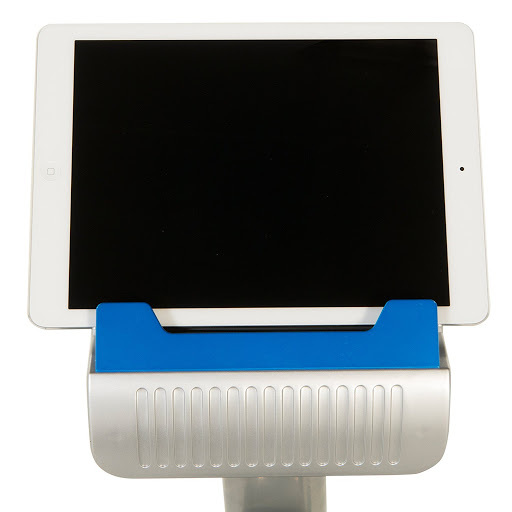 A tablet placed on the holder will cover the console display, which may be an inconvenience. Progear 555LXT has a one-piece steel frame. However, some parts are made of heavy-duty PVC material, such as the protective shrouds of the bike’s drive mechanism. This gives the bike the solidity and the firmness while pedalling. It also features a step-thru design, making it easier for users to get on and off the bike. Two integrated levellers for a solid workout platform and oversized crossbar tubing for added stability. 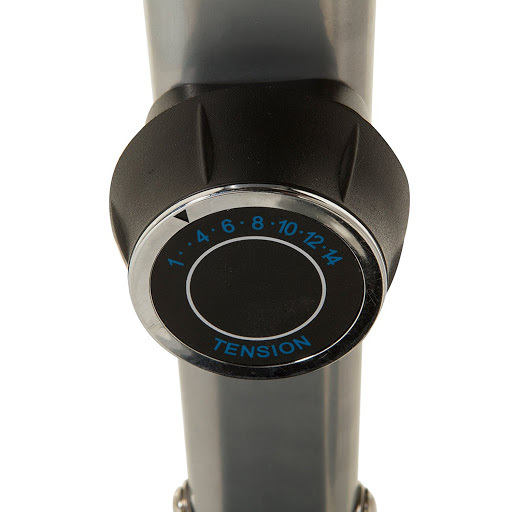 These stabilizers provide steadiness, combining with its low center of gravity keep the bike stable during workouts. The bike body is powder coated with corrosion resistant paint, which makes the bike look good in black and white. Transport wheels allow for easy movement, giving you the versatility to move your workouts to the family room while watching the kids or the den while enjoying your favourite tv program. By leaning it forward on its transport wheels, you will be handling less than 1/2 of the bike’s total assembled weight. However, one minus is that the frame does not have a folding design, which makes it harder to disassemble and store the bike. 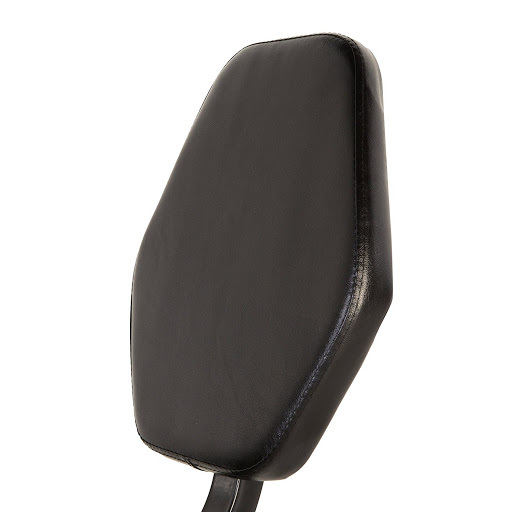 Progear 555LXT’s seat looks quite simple, not ergonomic. 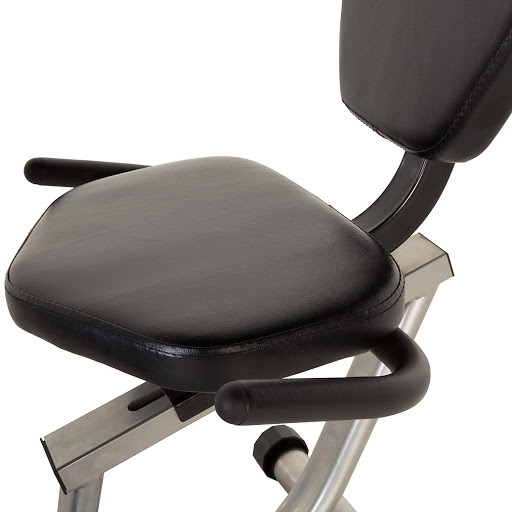 Nevertheless, its 2″ of cushioning on bottom and backrest ensure that you will feel comfortable and your lumbar will be supported. But maybe this padded design can reduce air circulation, which makes you feel hot and humid while long and intense workout sections. The seat is adjustable. 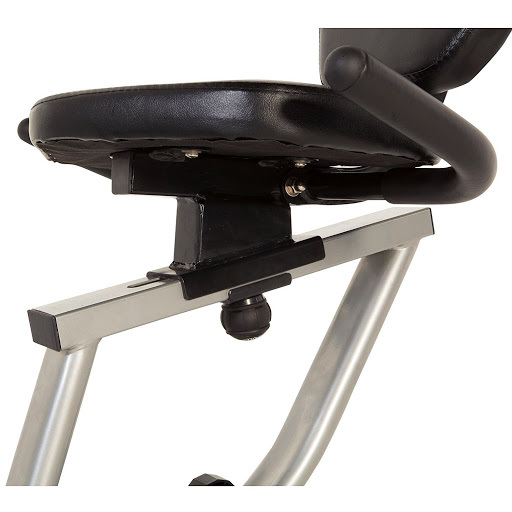 A slider seat rail system lets you adjust the seat forwards or backwards to fit your height (from 5’to 6’3″). If you’re taller, you can still use the bike, however, you may not benefit from a complete leg extension. The handlebar behind the seat gives your hand something to hold, securing your body, and lowering the pressure on your shoulder and back when you are riding. They are covered a thin sheet of rubber foam material to provide a soft grip feeling. The angle and position of them cannot be adjusted and they do not integrate pulse sensors like the handlebars of most recumbent bikes. This is a big disadvantage of Progear 555LXT when you cannot monitor your heart rate while exercising. 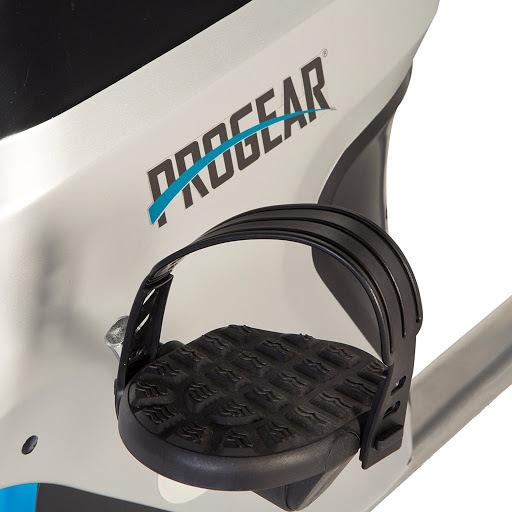 Progear 555LXT has the larger pedal design with safety straps that enhance the comfort of users’ foot while offering ultimate control, prevent any foot slippage when exercising, ensuring practising experience is smooth. A water bottle holder, positioned on top of the drive, is close at hand for easy access while working out. Drinking right amount of water every day is an essential habit to maintain your healthy lifestyle. The console table has a 3.5″ LCD display, with large numbers for easy reading. The screen allows you to monitor speed, time, distance, calories burned, and RPM (Revolutions per Minute). The computer is easy to operate with only 3 buttons: Reset, Mode and Set. MODE is basically used for navigation, SET for selecting values, and RESET is evidently used for resetting all the values. The console uses 2 AAA batteries (included in the package). However, when you place a tablet on this holder, it will block part or all of the LCD display, making you unable to monitor your performance during your workout. Thanks to magnetic resistance mechanism, Progear 555LXT has 14 levels of resistance that can easily adjust using this knob. The first thing to note is that despite the low price, this bike has some exercise programs programmed and a significant number of resistance levels like advanced bikes. Here is the summary of the pros and cons concerning to exercise experience. The Progear 555LXT design gives you a proper seating position with padded seat and backrest, combining with smooth magnetic resistance mechanism to provide a comfortable pedalling feeling. Your back, shoulders, knees and ankles are supported during the workouts. Progear 555LXT has a solid frame for a light recumbent bike, which brings you a firm operating. The bike also operates quietly thanks to its single crank drive belt. Using the console and the LCD screen, you can monitor the speed, distance, time, RPM and calories burned. These specifications, along with 14 Levels of resistance and 3 Goal workout settings, help you plan and achieve your fitness goals. In comparison with more advanced bikes, the design of Progear 555LXT is not so comfortable for seating position. And the seat appears to have trouble staying firmly in place when you are in intense workouts. The computer does not record your workout or upload stats to a fitness account to help evaluate performance. It does not track heart rate either. The producer did not feature backlighting for the LCD screen, which makes it harder to read in poor light conditions. When your workout intensely long hours, you will be sweat a lot, and padded seat/backrest do not offer enough airflow for heat dissipation. Thus, you may feel humid and hot. Progear 555LXT is not designed ergonomically, however, it does offer you a nice posture with low back support. When sitting, your back will be slightly backward, leaning your back on the seat back, holding the handlebar to lift your body up. As the pedals are in front of you, you will straighten your legs, together with the lifted upper body, making a proper posture when exercising. This posture can ensure that your arms, knees, shoulders and back will be supported, and you are protected from knee injuries, shoulder and arm pains, as well as diseases of the vertebrae. The chair is cushioned, however, it may be not soft enough when you work intensely, and the backrest is not adjustable, which may be uncomfortable for those have a short body form. To solve this problem, you can put a pillow put on the seat, not also your bottom will be more comfortable but also your lower back will be supported more. Thanks to the tablet holder, you can exercising while enjoying your favourite music/movie. You might pedal for hours without notice that. At the heart of Progear 555LXT is a heavy flywheel creating resistance and momentum, thus, when you start pedalling, your first several rotations are extremely hard. However, the more you practice the more smooth and easier the rotations become, even, you need to generate a force to slow down the speed. This resistance and momentum make it interesting and effective when practising, that make you don’t want to stop once started. To create the resistance, Progear 555LXT has a belt resistance mechanism. This kind of mechanism is not so advanced, but good enough to operate smooth and quiet. You can turn the knob to increase or decrease the tension. One more important thing is that the solid frame provides firm feeling during your workout. However, the seat appears to have trouble staying firmly in place when you are in intense workouts. But since it’s a recumbent bike, it is made for light and medium workouts, this maybe not a big disadvantage. 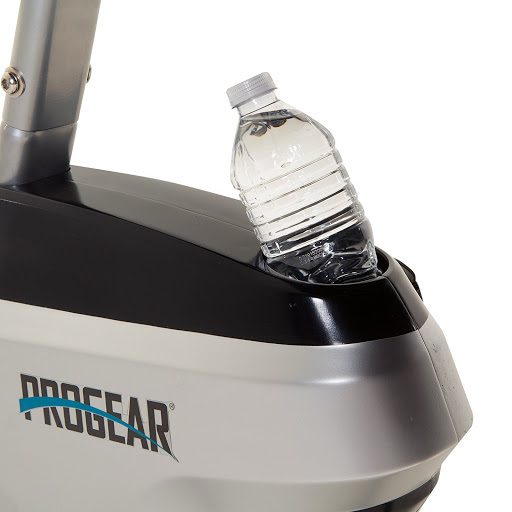 Progear 555LXT is perfect for cardio workouts, and physical rehabilitation/physical therapy treatments, as well as maintaining a healthy lifestyle. Its smooth operation and joint supports make it’s suitable for those have joint problems or being injured. To set workout goals: Use the Mode button to select Time, Distance, or Calories then push the SET button to increase the value of the goal from zero. You can set a single goal option or multiple goal options. If you set multiple goals, the countdown will continue until all goals reach 0. + Scan: This function give you the ability to view your workout statistic every 4 seconds. + Time: Show the total workout time of the current workout. + Speed: Show the current speed. + Distance: Show the total distance you have pedalled in the current workout. + Calorie: Show the total calories burned during the current workout. + RPM: Show the current revolutions in one minute. All of above are basic functions with the lack of some necessary functions like heart rate tracking. But to be fair, I must say that this console is quite advanced for a budget exercise bike. However, you will need two AA batteries for the console. The battery housing is at the rear of the console. 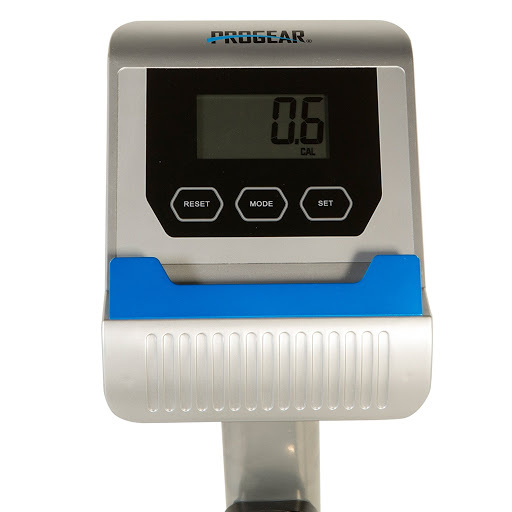 Progear 555LXT has a really affordable price, about $200. Overall, this is a great product for this price. If you don’t like to assemble it yourself, you can book an Exercise Bike Assembly Service Package, which around $70. However, I think you will enjoy the assembly section, making the bike all your like the IKEA product. Progear 555LXT has a 1-year warranty for structural frame and a 90-day warranty for other components (computer display, electronics, upholstery, foam, ball bearings, pulleys, belts, cables, wires, shocks, covers, tension, internal mechanism, wheels, pedals, knobs, accessories and hardware). Progear 555LXT has a high Amazon product’s star ratings. This index uses an AI model instead of a raw data average to give customers better information. In particular, it considers the factors like the age of a review, helpfulness votes by customers and whether the reviews are from verified purchases, to calculate the final score. So, basically, this product is high-rated by users. Despite some disadvantages, Progear 555LXT is a good exercise bike at this price. In the comment section, there are many positive reviews. They said that they had no problem assembling the bike and the riding feeling was great. Many enjoyed put tablet/iPad on the stand and watch Netflix while workout. They confirmed that the bike was really quiet, good support on user’s bottom, but low support on user’s lower back, the tension resistance was great. Some said that they have injured knee and have used the bike easily. They also like the small and lightweight design, which is suitable for a small apartment, of the bike. Also, there are some negative reviews, mostly because of the quality control process – these problems are easy to fix as that they offer replacements for defective products. But there are some comments that you might want to notice. Such as, the seat doesn’t stay tight while intense workout and the belts will start to shred along with the bearings being shot after a year of use, which means you need to replace them. You might want to consider these problems. You could accept these problems for a low price, or you could buy a more expensive one that comes along with a high quality – I will recommend some below. Progear 555LXT is an affordable application that surely can motivate you to maintain a healthy lifestyle. By committing to exercise using this bike, surely you can improve your cardiovascular health and stay fit. It is also good for physical rehabilitation/physical therapy treatment. Progear 555LXT is a great choice for those have injured joints and spine, children, women and oldsters. However, the features of Progear 555LXT are really basic and there are some disadvantages mentioned above, if you want a more advanced bike, you can check my recommendations below.